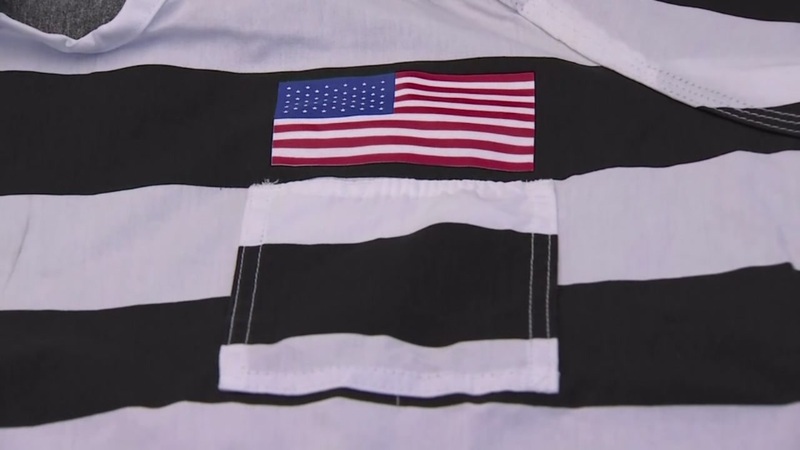 PHOENIX, AZ -- Arizona Sheriff Joe Arpaio and his jail staff handed out new inmate uniforms of the Fourth of July emblazoned with the American flag. Arpaio said, "This is one way to display that love, loyalty, (and) patriotism, even in a jail environment." The election-year move has some questioning whether Arpaio is trying score some political points. Republican candidate for sheriff Dan Saban told station KTVK, "This is a total exploitation of a very sacred day in our country. This is totally political." Eventually the new uniforms will be standard issue for roughly 3,800 inmates, and Arpaio -- who is running for a seventh term -- insists this has nothing to do with politics. He said, "Is he trying to say I'm using the American flag as a stunt? That's disgraceful for anyone to say that -- especially him who wants to be the sheriff." But for those who will wear the new uniforms, it was an event that came with cake and Gatorade.